A. Invisalign is a set of aligners that provide you with an effective orthodontic treatment for your crooked, crowded or misaligned teeth. Invisalign, manufactured by California based Align Technology, offers you orthodontic treatment which is not noticeable because the aligners are transparent trays. Q. How can the aligners straighten my teeth? A. 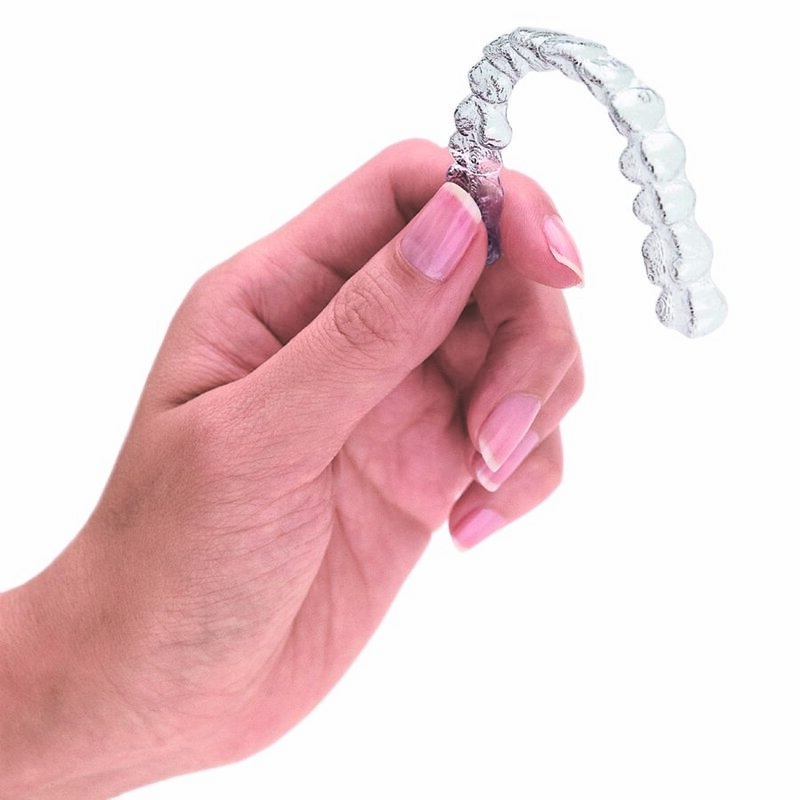 During your Invisalign treatment, you will be provided with a series of transparent aligners. Each aligner is designed to make small, gradual adjustments to position your teeth into a more desirable alignment. After two to three weeks, you will use the next set of aligners, which will continue to straighten your teeth in steps. Q. How long will my Invisalign treatment take? A. The treatment length will depend on the severity of your misalignment and can be determined by your orthodontist alone. However, on average, it takes about 13.5 months for adults. A. Invisalign aligners are most effective when worn for 20 to 22 hours per day and are removed for eating, brushing or flossing. Q. How often must I see my orthodontist? A. Your orthodontist will schedule regular appointments, generally about once every 4-6 weeks. Q. What are the primary advantages of Invisalign? The Invisalign aligners are seemingly invisible. Unless you tell them, no one is even going to notice that you are wearing them. Thus Invisalign is a perfect fit for your lifestyle. Invisalign aligners can easily be removed at any time of the day. You can eat and drink whatever you want during treatment. You can remove the aligners for brushing and flossing as you normally would to ensure good oral hygiene. Invisalign uses no metal brackets or wires that could irritate your mouth. In fact, these aligners are more comfortable in your mouth than traditional metal braces. You can view your virtual results and the whole treatment plan before you start. This way, you can see on a computer screen how your aligned teeth will look when your treatment is complete. Q. Will Invisalign treatment be painful? A. Some people do experience temporary discomfort for just a few days at the start of each new stage of treatment. This is absolutely normal and patients typically describe it as a feeling of pressure. It is one of the signs that your Invisalign aligner is working. This discomfort goes away in just a couple of days. Q. Can I wear the aligners only while I sleep? A. No. The aligners must be in place a minimum of 20 to 22 hours a day for the treatment to be effective. Q. Are there restrictions as to what I can eat while in treatment? A. No. Due to the removable nature of these aligners, you can eat and drink whatever you want while you are undergoing this treatment. In fact, you are required to remove these aligners for eating and drinking purposes. Also, you should brush your teeth after each meal and before reinserting your aligners to maintain proper oral hygiene and a fresh breath. Q. What payment options are available for Invisalign? A. Most orthodontists will allow you to choose from a multitude of options to make your treatment affordable. Usually all of them are flexible and affordable monthly payment plans. Many orthodontists also offer financing through CareCredit which is a third-party patient financing program that makes it easier for you to get the procedures you want. Q. Can I smoke while wearing the aligners? A. Smoking is discouraged while wearing aligners because of the possibility of the aligners becoming discolored. Q. Can I drink alcohol while wearing these aligners? A. A moderate amount of alcohol is fine, as long as you take care to clean your teeth and the aligners soon after. The fact that alcoholic drinks contain moderate amounts of sugar makes it possible for sugar particles to get trapped between your aligners/teeth. The same principle applies for any sugary beverage. Q. Do I need to wear a retainer after treatment with Invisalign is over? A. Most orthodontists recommend that anyone who has completed the Invisalign treatment should use a retainer to prevent teeth from slowly shifting back towards their starting position. Nevertheless, you can talk to your orthodontist about that beforehand.